On Wednesday, 16th January 2013, a significant step forward in the landscape of interfaith dialogue between Christians and Muslims in Ireland was launched at the City Hall, Cork by Deputy Lord Mayor , Councillor Emmet O’Halloran. A new resource booklet A Journey Together, the fruit of a two year project between Christians and Muslims sponsored by the Cork based organisation Cois Tine, aims to help Muslims and Christians living in communities to be good neighbours, colleagues and friends, as well as to understand each other better. Cois Tine is a multicultural organisation that respects and promotes the integration of people from all communities, cultures and faiths. The resource was researched by Gerard Forde. 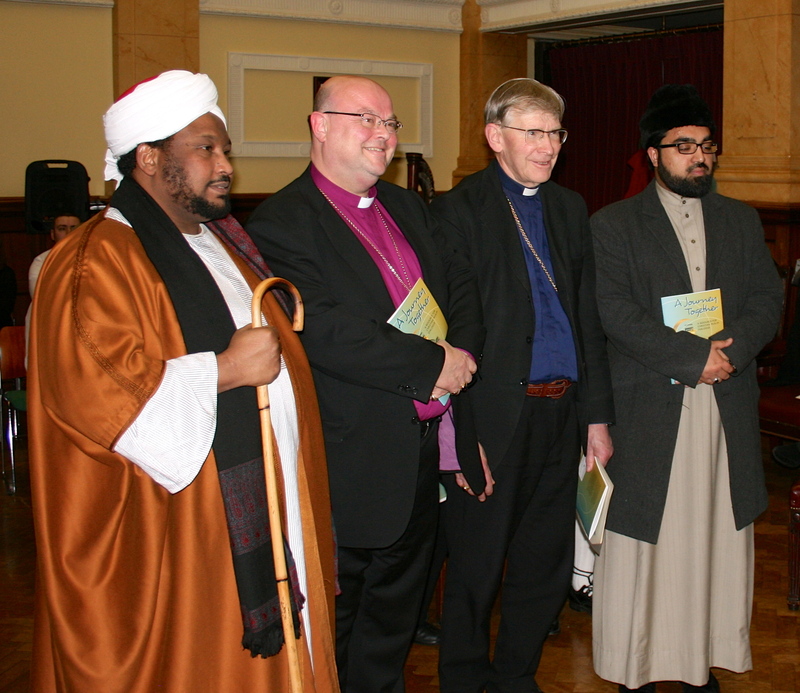 At the launch of ‘A Journey Together’ are (l-r) Sheikh Ihab Ahmad, Imam from Blarney Street Mosque, Cork; Bishop Paul Colton (Church of Ireland Bishop); Bishop John Buckley (Roman Catholic Bishop); and Dr Shaykh Umar al-Qadri Imam and President of Al-Muftah Islamic Educational Cultural Centre. The Reverend Daniel Nuzum, Ecumenical Officer in the Diocese of Cork, Cloyne and Ross was a member of the Muslim-Christian Steering Group for the dialogue project. During the last two years the project has engaged with Muslims and Christians in Dublin, Limerick and Cork. This resource, especially with its firm focus on the ordinary everyday interaction between Muslims and Christians is a welcome contribution to the promotion of mutual understanding, respect and cooperation between Muslims and Christians in Ireland. This entry was posted in Contemporary Issues, Cork, Ecumenism, Interfaith Dialogue. Bookmark the permalink.